standard nail polish brush staple set machine. 180 to 220 tufts / brushes a minute, soft start to full speed within seconds. 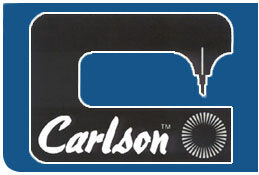 the Carlson model #25 has been a staple in the industry for over 50 years making single tuft nail brushes. standard machine offer a vibratory stem feed bowl, staple wire feed and form jaws, multi strand nylon spooled filament hitch feed system, index holder wheel with 30 insert positions, pnuematic guillotine trimmer, auto sort good and bad brushes, display menu screen and optional minimal sanding.